Ghostbusters 3 Is On Its Way! Now with the announcement that director Jason Reitman is setting out to do Ghostbusters 3 – suddenly fans who have been gutted by the current state of the Ghostbusters franchise are suddenly feeling there’s going to be something to celebrate. Kind of like the jubilation New York City felt when the boys saved the world from demon dogs, inter-dimensional badass ladies and marshmallow sailors. So, what’s the scoop on this. As far as we know Reitman will be directing this ‘sequel’. It will be taking place in the same universe as the original 1984 film and its 1989 sequel. 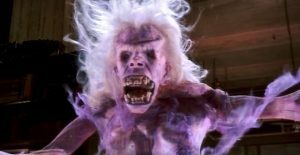 Any connection to the 2016 remake folks might look for is hopeless – that is a whole separate Ghostbusters universe that has nothing to do with this one. Plenty of fans are breathing a sigh of relief about that! 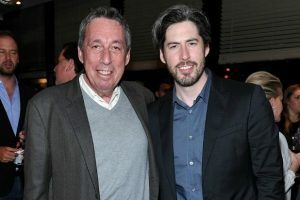 In case you don’t know, Jason Reitman is the son of Ivan Reitman, the famed comedy director who directed both original Ghostbusters films, along with a barrage of comedy films (Meatballs, Stripes, Twins, Dave). Father Reitman will be guiding his son over this sequel sitting in as producer. Along with father and son Reitman’s involvement, we’re also being informed that original cast members, Dan Aykroyd, Ernie Hudson AND Bill Murray will be reprising their roles. It’s none of that ‘cameo’ stuff as they did in Paul Feig’s 2016 remake. NO! This time they’ll be back playing Dr. Raymond Stanz, Winston Zeddemore and Dr. Peter Venkman. This is according to Hudson who has said, “Everybody is In”. Sadly, as we all know Harold Ramis died in 2014, so his presence will be missed. We don’t know the participation of any of the other original cast members yet. Rumors have ignited that Reitman is looking to cast four teenage characters. Two boys and two girls. It seems likely the goal is to ‘have a passing of the torch’ to the younger characters for ghost-busting in future installments. The film is set for release in 2020. Already Sony released a teaser trailer to start building excitement. But not everyone is excited about this. Leslie Jones, one of the stars of Feig’s female remake has come out with guns blazing. Deriding this sequel, annoyed her film is not getting its own sequel, its continuity is being ignored and comparing the move to something Trump would do. Feig has been somewhat more diplomatic with his anger, but is supportive of what Jones has said. As a result, all the old wounds that surrounded the 2016 Ghostbusters and the defense of its low box-office being due to sexist fans and internet trolls by the filmmakers are bubbling up again. They’re just not going to let this go. I find it hard to grasp that anyone would expect to see a sequel to Feig’s Ghostbusters. And it has nothing to do with an all-woman cast no matter how they try to spin it. If the movie had been a big profitable hit and audiences wanted to see more a sequel would have been greenlit immediately. It wasn’t a hit. Not many liked it. Why would Sony roll the dice on doing another one? Isn’t the general rule you make sequels to movies that are hits? Or did something change in Hollywood in the last couple of years with that philosophy? To salvage the Ghostbusters brand, Sony is going to go back to it again – a lot sooner than I ever thought they would. Now they’re planning a real third sequel continuing the story from the original films. Something they should have done in the first place. But, as longtime Ghostbusters fans who’ve been waiting for a real, genuine third film, they’re dreams of seeing it actually happen will also come along with controversy and derision from defenders of the 2016 remake. All this behind-the-scenes Ghostbusters saga has made it the more fascinating tale unspooling compared to any of the proton pack adventures any of the fictional characters are going on. It’s sort of like this: What’s the third movie going to be about? Oh the old Ghostbusters train some young Ghostbusters. Ok, fine. Nevermind that! Have you read what that person said about the other person today? And then the other person came back and said this! And then did you hear what they called Ghostbusters fans?!?! Wow! 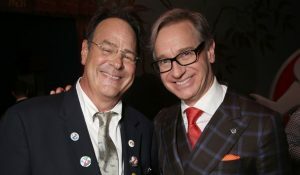 I find it more compelling watching Aykroyd publicly attack Feig, Jones going unhinged, the angry defense of Feig’s film and the lengths Sony is going to get a successful franchise started than anyone trying to catch Slimer again. I’m happy to read when everyone isn’t holding their tongues, acting polite and tweeting out supportive statements about this. Who wants to read sweet, polite PR statements. I say, if you’re angry about this new Ghostbusters sequel (no matter how irrational it might seem) let it rip! So, I’m glad Jones is unleashing her anger – it’s so much fun to read. I hope everyone from Feig’s flick bands together and throws tomatoes at Reitman’s sequel. That will be funnier than anything they did in that remake. I gave up on a real Ghostbusters sequel a long, long time ago. I think it was sometime in the mid-90’s where I just said, “Ah screw it!”. In fact, I don’t think I’ll believe that a third sequel is actually happening until it is actually shown in a movie theater. There have been so many rumors and announcements through the years that went nowhere. At the moment, this one doesn’t feel much different. I’d be curious about it sure, but I don’t think it will be half as entertaining as the real world battle happening now that Ghostbusters has become some kind of symbol of woman empowerment and those that criticize Feig’s film are not just folks who didn’t like the movie because it was poorly made, lazy and unfunny, but are the enemies. I always thought it was very convenient how any female who happened to not have liked the 2016 film was just ignored or dismissed. Like they were just random, inconsequential voices not given much weight since it didn’t fit the narrative that was being weaved for the defense of Feig’s movie. Reitman’s sequel is said to be a ‘passing of the torch’ movie, since you can’t have old people star in a movie you have to get some younger ones to take over. 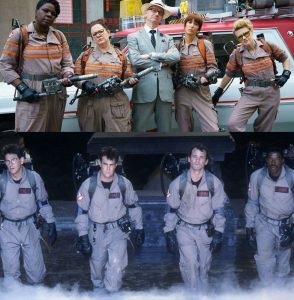 So, if Reitman makes the new young Ghostbuster recruits two male and two females, will those two female characters be appreciated? Or will there be complaints that it’s only two females and it’s sexist not to have all the Ghostbusters be women? And how many scenes will Bill Murray actually film? I picture him so utterly disgusted and tired of this Ghostbusters stuff they should be thankful he shows up at all for any kind of filming. He might not even get out of his car! Maybe he’ll just do a driveby and wave to the camera. They’ll be lucky to get that! I don’t think this will end here. I predict the Ghostbusters drama will get more attention, more quotes and tweets will take place, more arguments and articles will come forth. Things will escalate to mass hysteria again. While most movie fans just want to see a good funny movie and are hoping for one that delivers this time, this crazy battle will be happening again. And what will be said if Reitman’s sequel is a huge hit??? Will there be some kind of blame placed why this ‘sequel’ made more money than Feig’s ‘remake’? Maybe the marketing campaign could be held accountable or some kind of creative working of the books was done. That would have to be caused by some kind of conspiracy. It couldn’t possibly be fans and the general audience had more of an interest in seeing a ‘sequel’ right? You have to wonder how did a comedy about catching ghosts and putting them into boxes become the most controversial film franchise in recent years? Midnight’s Edge has done some excellent coverage of the Ghostbusters saga. Here’s their latest report on recent happenings. I didn’t see GB2016, not because of the female cast in general, but because I don’t like Melissa McCarthy in particular that much. It comes down to this fun little thing called “personal taste”. I fully agree with the broad notion that “women and minorities need better representation in pop culture”, but not liking a specific person doesn’t mean I’m some rock-headed caveman.